GET ALL THE LATEST TAKE AWAY SPECIALS HERE. Simply click on the restaurant's logo below and see what their current specials are. To KFC, great tasting products and guaranteed freshness is everything. We're open and honest about the quality of the products. Find out about our food and our Taste Guarantee to you. Finger Lickin’ Good moments are those times when friends and family are brought together by the delicious taste of KFC’s Original Recipe Chicken. The times when you hit the drive-through after a night out with friends. That time when you ate straight out of the Bucket on your family picnic, or that date when you got two straws for one Krusher. Those are the moments worth recording. Get the KFC Choc Brownie Super Sundae for only R21.90. 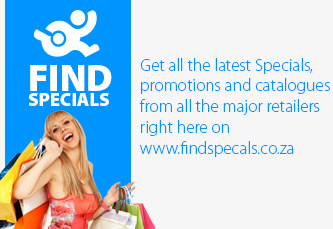 Find the latest special and specials catalogues from all the major retailers on one website!